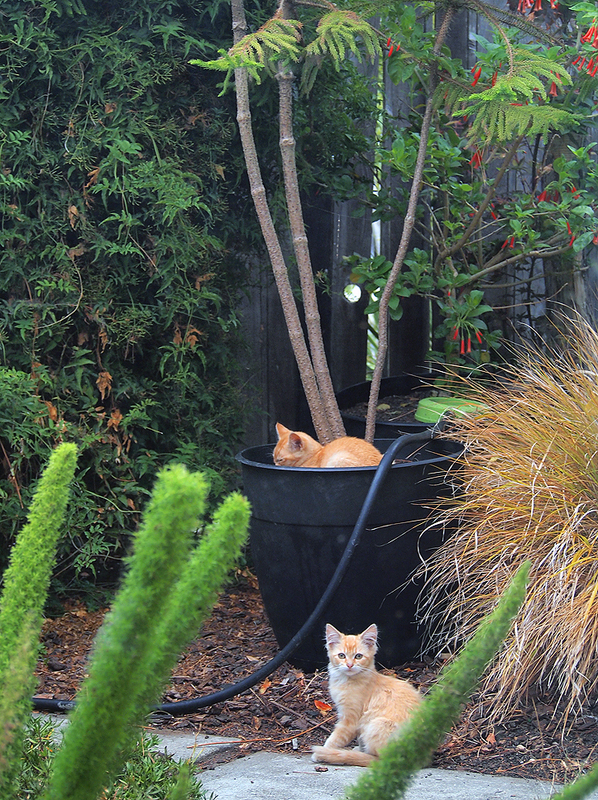 Thanks to the neighborhood cat lady, we have an abundance of more or less free-range felines in our area. One found a cozy place to nap in the Norfolk Pine container (which probably had a nice layer of compost on top). The catnapper was soon joined by a more vigilant sibling. In the front left is Protasparagus densiflorus ‘Meyeri’ (foxtail asparagus fern). At the right is a handsome speciment of Stipa arundinacea (New Zealand Wind Grass), which does marvelously well in this area, even during the drought. (I recently saw quite a few of these planted along the bay walk in Pacific Grove near Monterey.) Along the fence is true jasmine, and behind the Norfolk Pine (Araucaria heterophylla) in another container is Iochroma coccinea, with its tubular orange flowers.